Kenyatta Smith and Zena Edosomwan each stepped up in this game, leaving Crimson fans salivating. Among Harvard players, these two probably have the most potential and the most question marks. The sky’s the limit for these two, and flashes of brilliance on Saturday only confirmed that assessment. Kenyatta Smith had eleven points on 5-for-8 shooting (with a few silky-smooth baby hooks that just looked too easy), but his play on the defensive side of the court was most impressive. He finished with seven total rebounds, including three big offensive rebounds, and three blocks (and all this in only 26 minutes – a classic Tommy Amaker move). The fact that Smith had only three fouls to go along with his three blocks shows that he is becoming a more disciplined defensive player. Foul trouble did plague Steve Moundou-Missi, however, though a few of the referees’ calls were pretty questionable. With Moundou-Missi on the bench for much of the game, celebrated sophomore Zena Edosomwan got more minutes than usual, and he took full advantage of this opportunity. Midway through the first half, something seemed to click for Edosomwan, and he suddenly became a real force. Right before a first-half timeout, Zena did something he often does – he threw up a shot where he drew contact all the way into the paint and then missed a four-foot fadeaway, shying away from contact at the last second. After the timeout, however, Edosomwan took the contact, faked the fadeaway and laid in a contact layup. He then showed the same physicality while scoring on similar shots the next two times down the court, before returning to earth with a turnover and promptly getting pulled by Amaker. Did we witness an Edosomwan epiphany? Who knows, but regardless, Zena looks like he is starting to get it. Ivy League, beware. Finally, in a Wooden-worthy performance, Wesley Saunders simply went off. Tying his career high with 27 points, Saunders put the Crimson on his back and carried them to victory. Saunders has been one of the most potent scorers in the country all season, and the fact that his best scoring game came against Harvard’s toughest opponent (so far) underscores his valuableness. The Crimson’s early-season reliance on Saunders, however, raises the following question: Does Harvard need Wesley Saunders to score 20+ points every night in order to win? Saunders has scored 30 percent of Harvard’s points this year, whereas last year he scored about 20 percent of Harvard’s points. This increased scoring load is due in part to the departure of scorers who graduated in 2014 (such as Laurent Rivard, Kyle Casey and Brandyn Curry), but it is also due to Saunders’ increased aggressiveness and continued improvement. Granted, one player cannot be relied on too much. But players with Saunders’ abilities are so rare, it’s a wasted opportunity not to design the offense around him, and until teams learn how to shut down Saunders, why not keep riding him? And if these November games are any indication, Saunders can be relied on to put up extraterrestrial numbers night in and night out. After a gutsy, character-building win, the Crimson will take on a 5-1 Northeastern team at home on Wednesday night, as they look to continue their home dominance and prove their superiority in Massachusetts against another in-state rival. For all those unable to make it to Lavietes Pavilion, the game can be seen on NESN and the Ivy Digital League Network. My prediction? I foresee another résumé-building win for Harvard. I have to say, Saunders is an elegant athlete. Graceful, beautiful moves without looking forceful. Every few years the Ivy gets someone with preternatural talent like him. I still hate the Crimson and all that they stand for, but Saunders is indeed a pleasure to watch. If Kenyatta and Zena can get the minutes, and can play with confidence… and if Corbin Miller can become that 3-point threat he’s envisioned to become…. Saunders won’t have to score 20-plus every night for the Crimson to win. Great article! Two equally matched teams going at it from the opening tip. The crowd was really fantastic, as well. 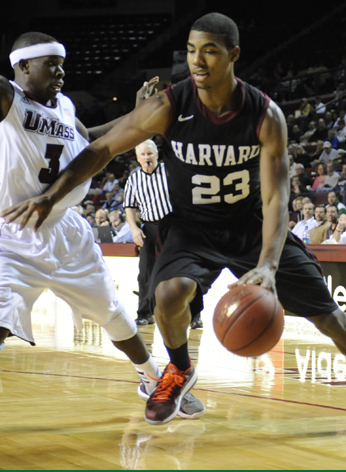 Harvard looked really good against a very athletic team. Saunders was incredible, especially the game winning basket. Chambers had a very solid game with 9 assists and only 2 turnovers against a team that pressed all game long. Smith was great as well. Tough, but winnable games against local competition the next few games before the Crimson gets a shot at Virginia. While I think Yale has a very good team, there is still a definite drop off from the top team in the Ivies.